With 120 square metres the redesigned Bugatti showroom in Brussels is the largest showroom of the French luxury brand in Europe. Today, Bugatti is celebrating the reopening of its showroom in Brussels in the new brand design. However it is not only the design that is new but also the address of Bugatti Brussels in the Elsene-Ixelles district at the heart of the Belgian capital. With an area of almost 120 square metres, the showroom is also the brand’s largest in Europe. Bugatti took the inauguration of the new showroom as an opportunity to present its new 1,500 PS super sports car, the Chiron, in Belgium for the first time. Since 2006, Bugatti’s exclusive sales partner in Belgium has been the D’Ieteren Group. 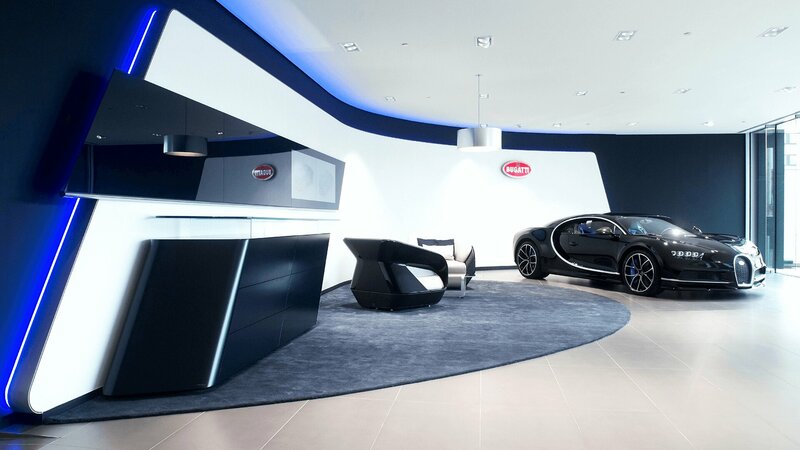 Bugatti Brussels is the seventh European dealership with the new showroom design. All in all, Bugatti is represented by 33 dealers in 17 countries around the world. Thierry du Parc, General Manager of Bugatti Brussels, said at the ceremony: “At Bugatti Brussels, we are very proud to represent this fascinating brand at a new location and with a new design. It is a great honour for us to be able to present to our customers the Bugatti Chiron, the ultimate super sports car and the latest icon from the house of Bugatti.” The D’Ieteren Group was established in 1805 and has been an official Bugatti dealer in Belgium from the beginning. In Brussels, Bugatti and D‘Ieteren have created a stylish Bugatti world. With Bugatti blue as the predominant colour, the showroom, with a floor space of almost 120 square metres, is characterised by clear lines and surfaces. Exhibits illustrate the impressive technical details of the Chiron. A communication strip running along a curved white brand wall presents information on products and highlights of the brand history. In addition, customers have the opportunity to configure their new Bugatti in a comfortable lounge featuring furniture from the Bugatti Home Collection. Three wallmounted pillars illustrate Bugatti’s brand values, Art Forme Technique, with films and exhibits.